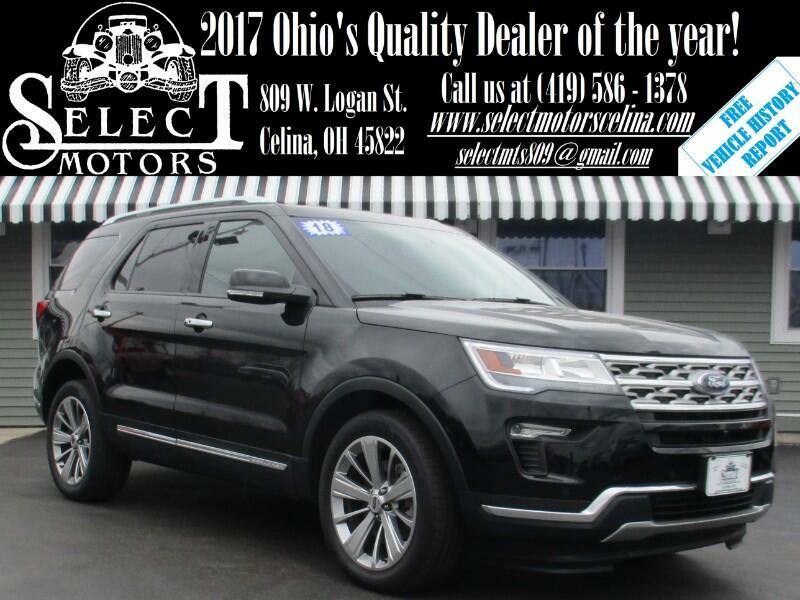 ***TXT US @: (419) 362 - 6200*** Navigation, heated/cooled leather, heated steering wheel, heated 2nd row, memory seating, power lift gate, backup camera/sensors, power folding 3rd row, power adjustable pedals, front parking camera/sensors, keyless entry with remote start, automatic headlights, Home Link, signal mirrors, dual automatic climate control, power windows/locks/mirrors, AM/FM, SirusXM, auxiliary and USB port, steering wheel mounted audio controls, Bluetooth, dual power seats with power lumbar, tilt and telescopic steering wheel, cruise control, information center, 20" alloy wheels. Warranties: Balance of Ford's 3 year or 36,000 mile bumper to bumper and 5 year or 60,0000 mile powertrain. In service date: 06/22/2018. Extended service contracts available. There are five different ways to configure your 2018 Ford Explorer: the base, XLT, Limited, Sport and Platinum trim levels, which cover a broad swath of features. The base, XLT and Limited models are available in front-wheel or all-wheel drive, while the Sport and Platinum are offered solely with all-wheel drive. Regardless of trim level, every Explorer is equipped with a six-speed automatic transmission. For 2018, many driver assistance features (adaptive cruise control, blind-spot monitoring, rear cross-traffic alert, lane departure warning and intervention, automatic wipers and automatic high beams) have been grouped together into a single options package. Base models, predictably, sit at the very bottom of the Explorer range. These models have 18-inch wheels, cloth upholstery and manually adjustable front seats, though a rearview camera and Sync voice commands spruce up things a bit. The XLT trim level is one rung up the ladder, adding a few standard features over the base trim level and desirable options that aren't available on base variants at all. With its balance between features and value, a well-equipped XLT will be a popular version of the Explorer. A non-turbocharged 3.5-liter V6 (290 horsepower, 255 pound-feet of torque) is standard on the base and XLT variants, while a 2.3-liter turbocharged four-cylinder (280 hp, 310 lb-ft of torque) is available as an option. Buyers who want to amp things up will be attracted to the Limited model, which adds leather upholstery, heated and ventilated front seats, power-adjustable pedals, a power tilt-and-telescoping steering wheel, premium audio and power-folding third-row seats. Note that the Limited comes standard with the turbocharged four-cylinder engine, but you can still get the regular V6 if you want.